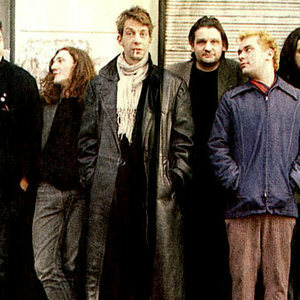 A very loose group from and around Antwerp, formed somewhere around '91, early '92. The key figure must be Rudy Trouv? (guitar/vocals, also making fame as dEUS member) and it's one of his oldest bands. The initial group also includes Heyme Langbroeck (trumpet/sax), Elko Blijweert (2nd guitar), Jacki Billet (bass) and Stef Kamil Carlens (drums/vocals, Zita Swoon). They began with a kind of lo-fi combination of jazz and rock with punky intentions. Sometimes described as "inaccessible" and "bizarre", though received by the press with enthusiasm. They began with a kind of lo-fi combination of jazz and rock with punky intentions. Sometimes described as "inaccessible" and "bizarre", though received by the press with enthusiasm. At it's peak there were 15 members. Rudy comments in '98: "Kiss My Jazz is a combination of ignorance and jazz. We are a mix of good and less good musicians. That's even necessary, because without good musician you wouldn't be able to play jazz, and without the bad ones you wouldn't be able to play punk". Their experimental jazzy style finally evolves to a more poppy, country/bossanova mix on In a Service Station which Rudy tells was inspired by being a lot on the road, touring with other bands, and "really cheap and bad TV-films." In 2000 they break up, Rudy explains that "We have explored all styles we wanted to explore."